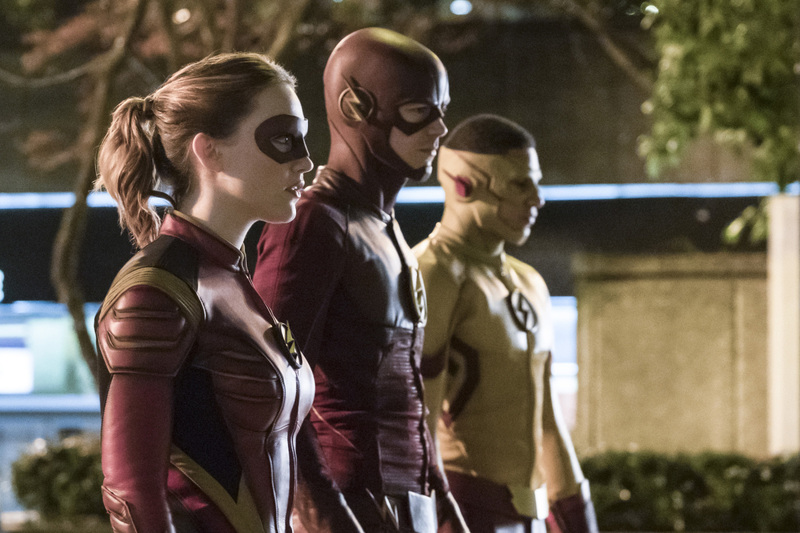 The Flash -- "Attack on Central City" -- FLA314a_0088b.jpg -- Pictured (L-R): Violett Beane as Jesse Quick, Grant Gustin as The Flash and Keiynan Lonsdale as Kid Flash -- Photo: Katie Yu/The CW -- ÃÂ© 2017 The CW Network, LLC. All rights reserved. It’s part 2 of our two-part gorilla The Flash adventure. HR has decorated the Speed Lab to not only celebrate the defeat of Grodd but also Friends Day (Earth-19’s version of Valentine’s Day). The Flash — “Attack on Central City” — FLA314b_0091b.jpg — Pictured (L-R): Carlos Valdes as Cisco Ramon and Danielle Panabaker as Caitlin Snow — Photo: Bettina Strauss/The CW — ÃÂ© 2017 The CW Network, LLC. All rights reserved. Cisco laments to Caitlin his bad luck with love when all of a sudden Gypsy appears through a breach attacking Cisco and Barry. Luckily, Harry uses a stun gun to knock Gypsy out. In the pipeline, Gypsy doesn’t remember what happened and only that she was on Earth-2 to catch a breacher. Team Flash realizes that Grodd has used Gypsy to open up a breach and that Grodd and his army are on Earth-1. Team Flash in unable to find Grodd and his army. Harry enhances Cisco’s vibe gear to see if he can vibe as to where Grodd will be so the team can get ahead of him. Cisco goes see that Grodd and crew will be at a certain intersection. Cisco asks for Gypsy’s help but she declines as Team Flash seems to have enough members that can take down Grodd. Gypsy only wants to go back to Earth-2 to complete her mission but also talks about only seeing death and destruction when Grodd took her over. So Cisco lets Gypsy go. At the intersection, the Flash, Kid Flash, Jesse Quick, Joe and a squad of CCPD are ready to take on Grodd. However, Grodd takes over Joe who threatens to make Joe kill himself. “Joe” pulls the trigger but the Flash manages to move the gun enough that the bullet just grazes Joe’s forehead. The Flash realizes that this was all a distraction to Grodd’s real mission which was kidnapping a General Matthew McNally. Grodd takes over McNally’s body to gain entry to Fort Reynolds and its nuclear arsenal. Back at STAR Labs, Team Flash wants to use the connection Grodd had with Joe against him. Using magnets on his brain to retrieve those memories, Joe draws a picture of McNally. This picture lets Team Flash know what Grodd wants with McNally. The team learns that using McNally, Grodd has managed to target a missile strike on Central City. The Flash zooms over to Fort McNally to stop the missiles from firing. However, the Flash has to through 90,000 5-digit combos to stop the missiles from launching. Luckily, the Flash gets the right combination with 15-seconds to spare. Grodd senses that the Flash has stopped the missiles and commands his army of gorillas to attack Central City. Barry contemplates killing Grodd as that is the only way to change the future. But Iris tells Barry not to kill Grodd as that is not what make him a hero or makes him the Flash. Barry shares his thoughts with Harry about killing Grodd and Iris’ thoughts. Harry agrees with Iris and tells Barry there is always another way. The Flash — “Attack on Central City” — FLA314a_0007b.jpg — Pictured (L-R): Jessica Camacho as Gypsy and Carlos Valdes as Cisco Ramon — Photo: Katie Yu/The CW — ÃÂ© 2017 The CW Network, LLC. All rights reserved. Another way is figured out. Barry asks for Cisco’s help in recruiting Gypsy. Our trio of speedsters arrive at the intersection from earlier. Grodd and his army is ready for a fight. The speedsters all try and take down the gorillas but to no avail. Gypsy and Cisco arrive with some help and they’ve brought Solovar who is all battle ready. And in a pretty cool sequence we get to see Grodd and Solovar fight. Solovar wins and grants the Flash’s wish to show Grodd mercy by leaving him on Earth-1 while the rest of the gorilla’s return to Earth-2. We learn that ARGUS is taken custody of Grodd probably cell mates with King Shark. Gypsy gives Cisco a good bye kiss before returning to Earth-19. Back at Barry and Iris’, Iris comes home to a romantic set-up. Candles are everywhere and rose petals are strewn all over the floor. Barry emerges with flowers in hand and tells Iris that he forget one important thing with his fixation on preventing the future and that is making a future. Barry produces his great-grandmother’s engagement ring and tells the story behind it. Barry gets down on one knee and asks Iris to marry him but we don’t hear her answer. In the coda, Wally and Jesse are watching Casablanca when Jesse feels like a Big Belly Burger. So Wally speeds away to get the grub but when he stops, he sees a vision of Savitar. I would love to have a spin-off where Harry is forced to be roommates with HR because those two were hilarious and love seeing Tom Cavanagh play two completely different characters in an episode. Harry is not very happy having to share Team Flash with someone he calls a moron. Jesse tells her dad that she is moving to Earth-1 to be with Wally. Harry takes it very well and accepts Jesse’s decision as long as she is happy. Later, Wally thanks Harry for being so cool about Jesse moving to Earth-1 to be with him. Harry tells Wally that as long Jesse is happy he is but sort of indicates to Wally that he is dying and doesn’t have much time left. Wally then tells Jesse that he doesn’t think it is a good idea that she moves to Earth-1 and that she should spend whatever time she has left with her dad. Wally tells Jesse that Harry told him that he is dying. Jesse sees through her dad’s BS and calls him on it and emphatically states she is moving to Earth-1. Near episode’s end, Harry says goodbye to his daughter and gives a warning to Wally to be good to her. The Flash — “Attack on Central City” — FLA314a_0039b.jpg — Pictured (L-R): Sean Poague as Accelerated Man and Jessica Camacho as Gypsy — Photo: Katie Yu/The CW — ÃÂ© 2017 The CW Network, LLC. All rights reserved.